Company Intranets are an invaluable resource for employees – a place to find key policies, find out who’s who, share knowledge and keep updated. But many Intranets are sadly unloved and uncared for. There are many reasons for this, but as we visit companies to help them reinvigorate their intranets, we find similar issues cropping up over and over. Here are a few things to consider to breathe new life into your Intranet, or to put into the planning for your new system. Your intranet is alive - it needs caring for! Many unused intranets that we see were fundamentally sound systems when they were built. Over time they have had content added in an unstructured way, creating clutter. Content that was uploaded on go-live hasn’t been reviewed and is now out of date. Now, when people want to find something, they don’t really know where to look, and when they do find something it is out of date. New features have been added but not publicised, and so aren’t being used. The company may have been restructured, and staff changed, but this hasn’t been reflected in the intranet. The most important thing for any intranet, long-term, is that it is run as a proper, live, important system. This means that it is on an agenda of a management team meeting, and there is at least one person who has it in their job description to maintain it and keep it tidy. You, and the rest of the company, need to have a clear view of what the intranet is there for. Is it a simple signposting system for other company systems and information sources? Is it the main point of reference for company news and information? Does it contain all of your company’s policies and forms, and are these guaranteed to be the most up to date ones? Is it a tool for new starters to use as part of their induction? Is it a knowledge-base where everybody (yes, everybody!) puts information that is valuable to the business? Once you are clear on why you are creating an intranet, it becomes much easier to get people engaged and to work out what content should and shouldn’t be added. SharePoint gives you the ability to automatically send out reminders when content needs to be reviewed, and you can run reports showing content that is out of date. These should be run regularly and ankles bitten until content is renewed. Most importantly – get rid of those ‘coming soon’ pages. If it isn’t there, don’t waste people’s time by telling them it isn’t there. It just gives the impression that the intranet is a ‘work in progress’ rather than something you’re actually proud of and want them to use. It needs to be clear to the user what the system does, how it works and where to find things. Keep the homepage clean, with clearly identifiable areas for news, links and navigation. Make sure that you have a navigation system that is easy to use, is consistent through the whole site, and that reflects how your company is structured. Get feedback and monitor stats to see what people like and what they don’t, and act on this to improve the intranet over time. It’s lovely to let each team put lots of information onto the intranet about themselves, and upload every last piece of useful guidance. But there will be key information in your organisation that it is important that people can find quickly. Expense Form, Health and Safety Policy, Product Key Facts, Research Papers etc. By clearly identifying what people need access to, and clearly organising this, you produce a system that is relevant and useful. You’re aiming for an Intranet that people use for their day-to-day working life, and a system that, if it breaks, people will get upset about. Pictures of the marketing manager’s cat probably won’t pass this test! So many intranets, especially SharePoint Intranets, give each team a nice calendar, task list, noticeboard and ‘general’ document library. Many teams have no use for these, and they sit there empty. So many people then go to these pages, see nothing there, think ‘that’s a rubbish page’, and don’t delve any deeper. Occasionally, team calendars and tasks lists can be great features. My advice is, only give them to teams when they ask for them, and then, if they don’t use them, take them away. Use the page for something useful – latest policies or user guides, performance dashboards, signposts to key information…. Intranets search systems rely on good content, and on this content being properly tagged. Google has the advantage that billions of users’ browsing habits inform the search algorithms of what the most relevant content is. Your intranet doesn’t have that advantage, and so you need to give it more help in terms of telling it what each document is. Take some time to set up the meta-data, and try to encourage people to fill this in when they upload content. The most popular intranets tend to have one or two features that lots of staff love. This could simply be a well-organised policies library. It could be the Phone Book or the Knowledge Base. Sometimes a Marketplace or forum takes hold and encourages networking and collaboration. Try to find out what staff want from an intranet, and put this in a key position to drive footfall to the site. It often doesn’t take much in terms of graphic design work to make your intranet look a million dollars. It should be professional, tidy, in keeping with your corporate brand, but with its own ‘personality’. Systems designed by techies rarely look impressive, and a great system can be made to look cheap by a lack of design input. Your intranet will probably be the first thing that people see in the morning when they turn on their PC, so it needs to make them feel proud and valued. 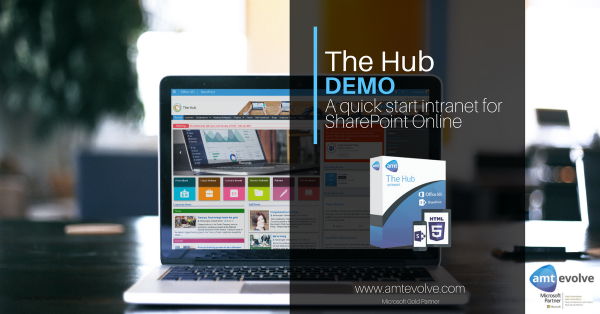 If, like many others, you are using SharePoint Online for your intranet, there is huge scope to build mini-systems that will make your organisation run more efficiently. Anything from simple document approval workflows, up to full-blown quality management systems can be built on SharePoint online. Because SharePoint is a mature collaboration platform, these systems can often be produced at a fraction of the cost of fully bespoke software. And by using SharePoint Online and Office 365 you are cutting down ongoing support and licensing costs by leveraging the investment that you have already made. Interested in how AMT could help you improve and maintain your current intranet, to ensure you get the most out of it? Join our next Hub Demo!